NOH8, Photo Credit: Adam BouskaWhen J. Elaine Marcos takes the stage, laughter will ensue! Recently seen as the scene-stealing "Cynthia" in Broadway's "Priscilla Queen of the Desert," J. Elaine has left a very deep impression of what it means to be a great comedic actress! Her other Broadway credits include "A Chorus Line," "The Wedding Singer," "Sweet Charity," "Wonderful Town," "Flower Drum Song," and "Miss Saigon." J. Elaine has shined in such films and television series as "Morning Glory," "Farm Girl in New York," and "Every Little Step," "I Just Want My Pants Back," "Rescue Me," "30 Rock," "Royal Pains," and "Lipstick Jungle." Additionally, J. Elaine can be seen doing improv/stand up comedy if given at least 5 minutes and a mic. This fall, J. Elaine will be starring in the Broadway revival of "Annie" as "Lily St. Regis" at The Palace Theatre (1564 Broadway, between 46th & 47th Street). Click here for tickets and follow the show on Facebook and Twitter! 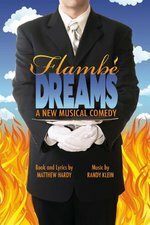 This summer, J. Elaine will be delighting New York Musical Theatre Festival audiences in Matthew Hardy's "Flambe Dreams" from July 9-14 at The 45th Street Theatre (354 West 45th Street). Click here for tickets and follow the show on Facebook and Twitter! For more on J. Elaine be sure to visit http://www.jelainemarcos.com and follow her on Facebook and Twitter! 1. Who or what inspired you to become a performer? My mom put me into dance classes and that was pretty much it. I caught that "rush" from performing in my recitals and during summer musical theatre camp and it just felt like so much fun. I'm reminded about how lucky I am to do this for a living when I see kids talk about their school productions that only lasted for two days and I can see that they just loved the experience and can't wait to do it again. It's a feeling of "AHHHH THAT WAS SO MUCH FUN, I need to do it again!!" 2. Who haven't you worked with that you would like to? Judd Apatow, Christopher Guest, Steve Carrell, Ellen DeGeneres....Or maybe I just want to play with them and get paid. 3. This summer you will be in the NYMF show "Flambe Dreams." What attracted you this show? I heard one of the songs from the show that my character would sing, and it sounded like something I could really get to "play" with. I'll do almost anything for a laugh, that's my motto. 4. This fall you will be starring in the Broadway revival of "Annie." What excites you about being part of this iconic show? What do you hope audiences come away with after seeing this new revival? I'm very excited about doing a show that I've never done before. In addition to the fact that I never thought I would have a part in "Annie." When I heard it was coming I didn't think there was anything I could do in that show, but thankfully that's what agents and casting directors are there for! I am extremely excited to we working with Katie Finneran!! We had actually worked together very briefly on "Royal Pains" together in a very serious scene. This will definitely be a different experience. I just want audiences to have a good time at the theatre and to experience live theatre. 5. What do you identify most with about "Lily St. Regis"? Other than being a Saint?? Well, it's like playing Cynthia. Having that wild side and drive for what you want and doing whatever it takes is familiar to me. 6. You just finished up your run in "Priscilla Queen of the Desert." What did you enjoy most about playing "Cynthia"? I loved playing "Cynthia" so much, because she let me say and do things that I would never be able to really say as J. Elaine. It's like that other side of me that gets to act up and be wild, but it's ok and acceptable and....I get paid to act that way and people just laugh at it instead of being completely offended or insulted. 8. What have you learned about yourself from being a performer? I have learned that I am Asian. Not that I didn't know that but it's funny growing up in my hometown, I never identified myself as a Filipino, just J. Elaine. Now I notice from casting sessions and learning your "type" and how people in the business perceive you. So I've learned to embrace uniqueness and feel proud to be a Filipino. 9. What's the best advice you've ever received? Just breathe and be in the moment. 10. If you could dream about anyone while you sleep, who would it be? Dream about anyone? I would say.....that guy I'm thinking of right now is who I dream about. That's as specific as I can get. 12. Favorite way to stay in shape? Bikram Yoga at my favorite studio Bikram Yoga East Harlem with amazing Broadway diva studio owner Stephanie Pope. Also biking and sticking to a raw food diet are also essential. 13. If you could have any super power, which one would you choose? If I had a super power, it would be to make tropical fruits grown anywhere I wanted. Like my backyard in East Harlem.